A juicy idea for good health? It’s hard to avoid hearing references to the juicing craze. Stores and juice bars advertise their latest creations; a friend talks about how juicing cleared her skin or helped her lose weight; Dr. Oz promotes juice cleanses, then warns of risks. But what exactly do people mean when they say they’ve started juicing? And is it a good idea? Dallas-based nutritionist Lauren Talbot says a juice is simply water, natural sugars and enzymes from fruit and vegetables, with the fiber removed through the use of a juicer — not a blender, which keeps fiber intact. People who use a blender are creating smoothies, juicing proponents say. The distinction matters, because they say you’re getting a higher concentration of nutrients in juice. “Could you imagine eating 6 pounds of vegetables in the morning?” Talbot asks. It would be nearly impossible, but removing the fiber allows you to consume those 6 pounds in the form of juice. Still, some think the benefits of juicing have been oversold. We talked to several experts about how to incorporate it into a healthy diet. Supporters of juicing say it adds a wider variety and more servings of vegetables to your diet in a concentrated amount, while reducing food cravings because the added nutrients replenish the body’s deficiencies. They say it could also lead to clearer skin, better sleep and a stronger immune system. Other nutritionists say juicing should not be seen as a cure-all. For starters, they say, juicing fruit and vegetables eliminates fiber. She also says juices are full of calories but don’t stave off hunger the way solid food does. Lona Sandon, an assistant professor of clinical nutrition at University of Texas Southwestern Medical Center, says juicing takes away the process of chewing, which can mean reduced feelings of satiety, or feeling full. But Zerner says that because most Americans do not get even one serving of fruit and vegetables a day, let alone the five she recommends as the minimum, she supports juicing — as long as people are aware of the pitfalls. Although Sandon says she’s turned off by juices that don’t look or taste good, Talbot says she has recipes that are tasty as well as nutritious. For a basic juice, Talbot says you want a high-volume vegetable, such as celery, cucumbers or romaine lettuce. She also adds dark greens, such as kale and spinach, and herbs, such as a handful of cilantro or parsley or a small piece of ginger root. Talbot says lemon cuts some of the green taste. 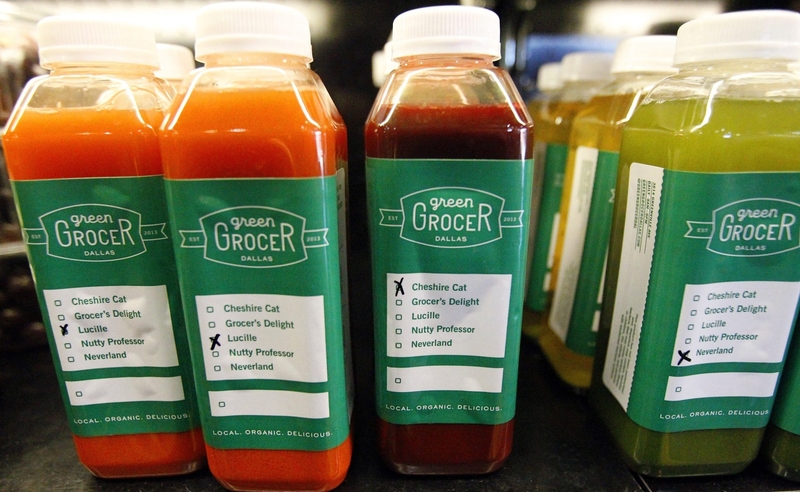 In a cleanse, juices are used to replace entire meals. Sandon and Zerner advise against that. Zerner also said many of the weight-loss and detoxifying claims behind juice cleanses are false and misleading. Talbot also says weight loss is not a reason to do a cleanse. She sees it as a starting point for people looking to change their lifestyles, or a reset button if you feel like you’ve been indulgent. When clients want to do a juice cleanse, Talbot and Bernstein advise them on what to eat before and after. Bernstein suggests they have two juices a day and eat raw salads, without added oil or salt, for about a week before the cleanse. “I would never recommend that someone on the standard American diet come in and do a five-day cleanse. That’d be very uncomfortable,” Bernstein says, adding that it could cause headaches and nausea. Having a crazy night out before a cleanse would be a shock to the system, Talbot says. Scrub and wash all produce (organic fruit and vegetables are the best option for juicing). Cut each ingredient into pieces that will fit and put them through your juicer. Typically greens should be juiced on low and harder-skinned fruit and vegetables on high, but it will depend on your machine, as will the amount of juice yielded. A Breville JE98XL Juice Fountain Plus made about 3 cups. Note: Feel free to add more or less lemon or ginger, depending on your preference for the taste. If not organic, the lemon should be peeled, which will reduce the flavor.